In Santo Domingo of the 90s, subcultures flourish and, with them, practices and discourses that enabled a new ethical platform for artistic production. 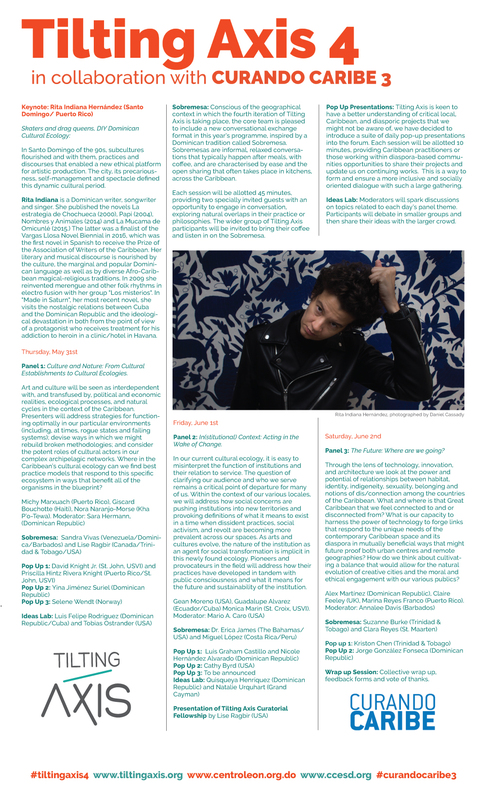 City and precariousness, self-management and spectacle. En el Santo Domingo de los 90 florecen las subculturas y, con ellas, prácticas y discursos que habilitaron una nueva plataforma ética para la producción artística. Ciudad y precariedad, autogestión y espectáculo. 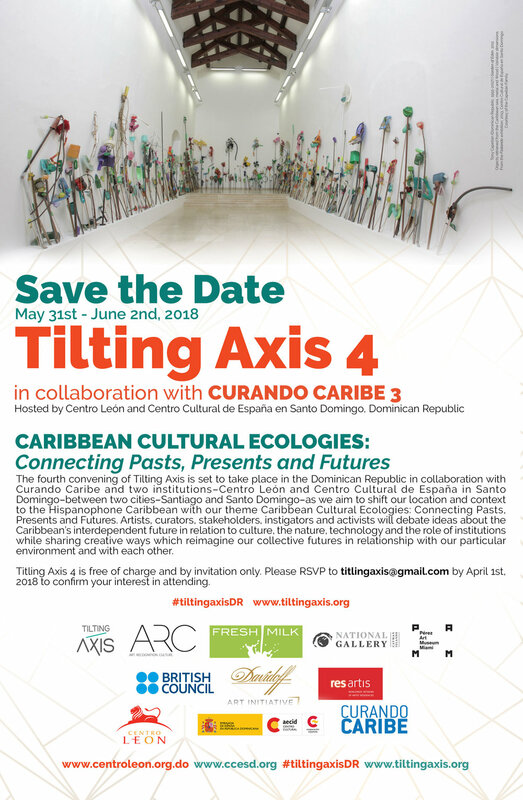 Tilting Axis 3: Curating the Caribbean (May 18 -20, 2017) builds on discourses begun at the inaugural 2015 meeting held in Barbados followed by the second iteration in Miami in 2016. This third convening at the National Gallery of the Cayman Islands (NGCI), is inspired by the Latin root of the word, “curare” meaning to take care. TA 3 asks how artist led initiatives, institutions, and government cultural departments among others in the Caribbean are nurturing the visual arts sector through exhibitions, residencies, programming, arts education and cultural policy? The conference will explore forward thinking models actively demonstrating how the Caribbean’s fragile arts ecology is being enriched, provoked and buttressed, through a curatorial lens by professionals both in and out of the archipelago. 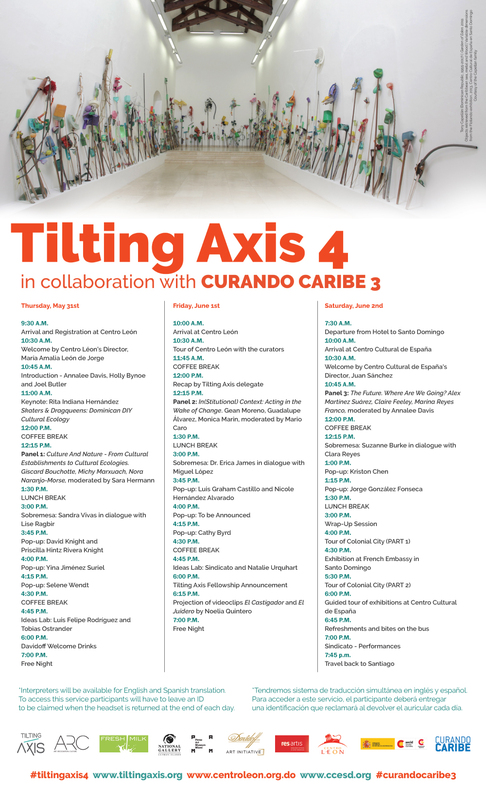 Tilting Axis 3 is free of charge and by invitation only.